The Hanover Block is available now (and for another 24 hours or so) for only 99¢ (down from the regular digital list price of $3.99). 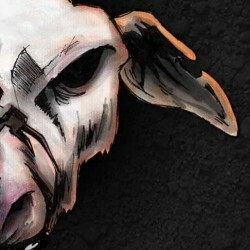 If you've been wondering what the hell that thing on the cover is, now might be the time to find out. Living in the long shadow of a tragic accident, Marion struggles through his solitary suburban life. He's resigned himself to a static existence, to living and dying in a world where every house looks exactly the same. Then he notices changes in his neighborhood. Tool sheds and playhouses are cropping up all over, hastily constructed and set at odd angles. The nutjob down the road builds an outhouse in the middle of his front yard, and the guy right next door is erecting two geodesic climbing domes, one nested inside the other. People are doing strange things on their lawns. 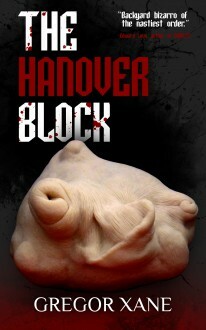 Grab The Hanover Block at the Amazon US site for only $0.99! Snag The Hanover Block at the Amazon UK site for just £0.99!